FILE - National Security Adviser John Bolton unveils the Trump Administration's Africa Strategy at the Heritage Foundation in Washington, Dec. 13, 2018. “This sounds like a real return to the policies of realpolitik during the Cold War, when allies were based on their opposition to communism or the Soviet Union rather than good governance, human rights, economic prosperity and so forth,” Cooke said. 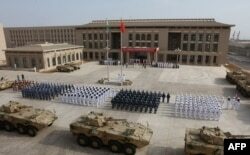 FILE - Chinese People’s Liberation Army personnel attend the opening ceremony of China’s new military base in Djibouti, Aug. 1, 2017. Bolton painted Moscow in similarly negative terms, describing a government concerned only with self-interest. “Russia advances its political and economic relationships with little regard to the rule of law or accountable and transparent governance,” he said. “When you don’t see the bigger chessboard, you actually miss opportunities to advance U.S. interests and to improve African prosperity,” Devermont said. The new policy doesn’t acknowledge many of the global players jockeying in Africa. India, Iran, Turkey, Saudi Arabia, Qatar and the United Arab Emirates — all of whom Bolton left out of his remarks — have made significant investments in Africa, from the Horn to Johannesburg. A better approach for the Trump administration, Devermont said, would be to account for the many multilateral relationships unfolding in Africa. “They’re major players putting [in] lots of money and advancing their goals, and we lacked from this administration [information] on how they are going to navigate that,” he said. 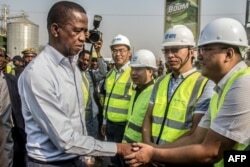 FILE - Zambian President Edgar Lungu, left, greets Chinese workers during a walk on a major road in Lusaka, Zambia, Sept. 15, 2018.